When the first edition of a book published in 1997 already fetches upward of twenty-thousand pounds, it is sure to have represented a literary milestone. Such is indeed the case with JK Rowling’s peerless masterwork Harry Potter and Philosopher’s Stone which had an initial print run of only a thousand copies, half destined for libraries across the UK. It took Mrs Rowling almost five years, most of them marred by personal tragedies and setbacks, to finish her debut novel. She did so as a single mother, diagnosed with clinical depression, unemployed, and on meagre welfare benefits. Toting her baby daughter from one Edinburgh café to the next, she steadily worked towards the conclusion of an idea formed in 1990 during a train journey from Manchester to London. Mrs Rowling’s perseverance paid off. The first of what was soon to become a series of Harry Potter books sold close to 110 million copies worldwide. However, it was the eight-year-old daughter of Bloomsbury’s chief executive who sealed JK Rowling’s fate by bluntly stating that her book “was so much better than anything else.” Prior to that verdict, twelve publishers had rejected the manuscript for being too long. With her seven epic Harry Potter instalments selling a grand total of over 400 million books, Ms Rowling became the world’s most widely read author. The release of the last of the series, Harry Potter and the Deathly Hallows, turned into a global event. On the eve of July 21, 2007, young and older readers alike queued up in long lines in front of bookstores to grab a precious copy at one minute past midnight British Standard Time – the book’s official moment of release. That same day, the seventh Harry Potter title became the world’s fastest-selling book ever with well over 11 million copies sold. A storyteller of almost unequalled talent, JK Rowling thrives on challenges. Turning to adult literature, she left the Harry Potter world of fantasy behind to tackle societal issues such as class, politics, drugs, and prostitution in A Casual Vacancy. Her adult debut novel promptly sold a million copies and was made in a soon to be released BBC television drama series. Checking to see if her writing could attract a readership without the name recognition, JK Rowling assumed the pseudonym of Robert Galbraith for the release of The Cuckoo’s Calling, a detective novel. 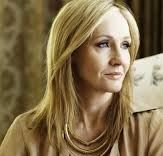 It took the literary critics and editors of The Sunday Times all of three months to unmask Robert Galbraith and confirm that the book had indeed been written by none other than JK Rowling. However, she did prove her point: A Cuckoo’s Calling was exceptionally well received though the book sold only about 1,500 hardcover copies up to the moment the true identity of its author was revealed. Immediately afterwards, sales shot up by 4,000%. Working her way up to almost immeasurable wealth and fame, JK Rowling has not forgotten about the less happy times she had to experience. Through a charitable trust, financed to the tune of £5.1 million annually, she helps fight poverty and social inequality in Britain. She also wrote two booklets that raised well over fifteen million pound for Comic Relief – an anti-poverty fund. JK Rowling has also donated sizeable amounts in support of research and treatment of multiple sclerosis, the disease her own mother died from while the first Harry Potter book was taking shape.